Bic is one of the most prominent manufacturers of cheap pens and pencils (and other necessary cheap plastic things). They have several lines of pens and pencils, some as expensive as a dime and some a bit more. 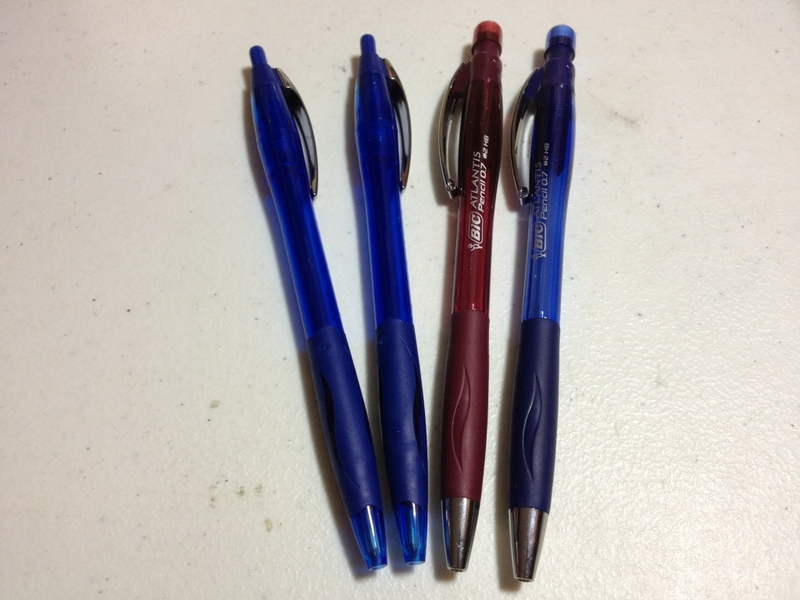 The Bic Atlantis is a set of pencils and pens in various colors, which happen to be called the same thing. Today I’ll be taking a look at the Blue ballpoint and the 0.7mm mechanical pencil. Despite sharing a name, the pen and pencil don’t share bodies. They do have similar styling that can be described in the same way, with the pencil being slightly thicker and a bit longer. Starting from the tip, there is a small cone, metal on the pencil, plastic on the pen. This is followed by a thin, hard rubber grip which is all right, but might as well not be there, in my opinion. 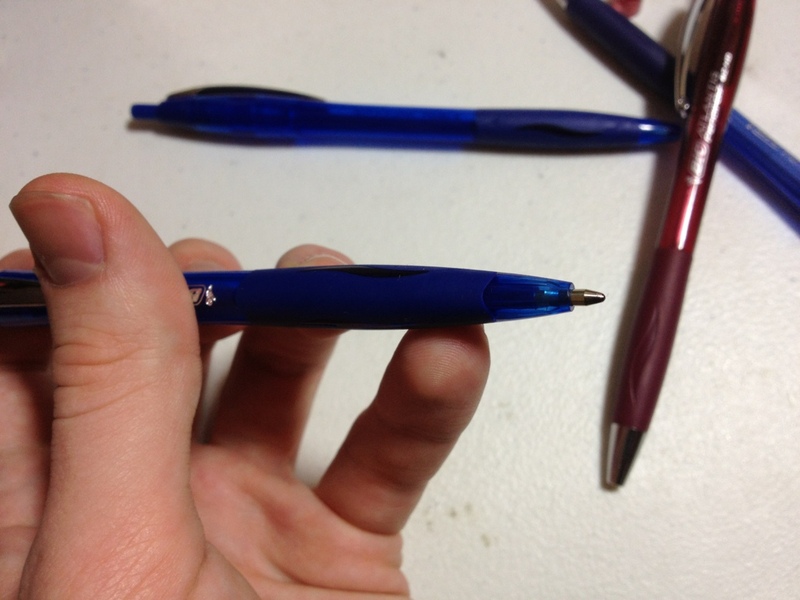 Within the grip it is a clear plastic wave in the pen, while the wave is impressed into the grip of the pencil. The barrel is relatively smooth and has all necessary information. Neither have a way to twist open the barrel, but around the clip both can be opened and the insides removed (the pen is glued). Above that is the clip, which is quite different on each. The pen is a very firm, stiff piece of metal, while the pencil is much more loose and is wrapped over into the plastic body. On the top is a clicking mechanism. The pen is surprisingly quiet and unsatisfying. You’d never know it clicked if you closed your eyes, but it works well. The pencil has an eraser and a cap on it, the eraser can be removed to allow the pencil to be refilled, and the clicking works well. So both are quite different, but they are similar enough to be in the same category. The pen gives a very fine line, which is quite smooth. 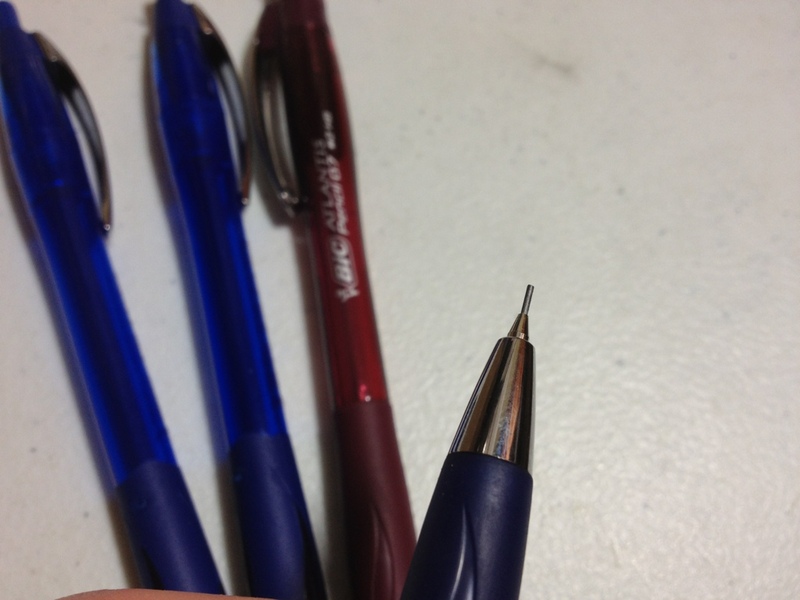 However like most “smooth” ballpoints it tends to blob often and pick up paper fibers. The color is also, like most ballpoints, quite waterproof, meaning it won’t run without being completely and utterly soaked. The pens can technically be refilled, but they aren’t supposed to be. The pencil is standard 0.7 and HB, meaning it is smooth but not too smooth. They also have a retractable metal tip to prevent the inside of pockets and bags from being torn, and there is a spring which prevents the lead from breaking due to excessive pressure. I honestly think that HB (#2) is a bit too soft, but for most writing and sketching purposes it does quite well. Overall the Bic Atlantis set is very lopsided. The pen is standard fare and not really worth much. It doesn’t do anything better than anything else in the price range, though they are quite cheap. The pencils are twice as expensive, at least, but are much more worth it. They come with extra lead and erasers, and the spring and cover mechanisms for saving the eraser and lead are almost unique for the price. It’s a great little thing that I quite enjoy using. And it might become a sketching mainstay. This entry was posted in Beginner Supplies, Utensils and tagged 0.7mm, art supply, atlantis, ballpoint, ballpoint pen, bic, bic atlantis, pen, pencil, pencils, review by Dragon Co (Austin Smith). Bookmark the permalink.